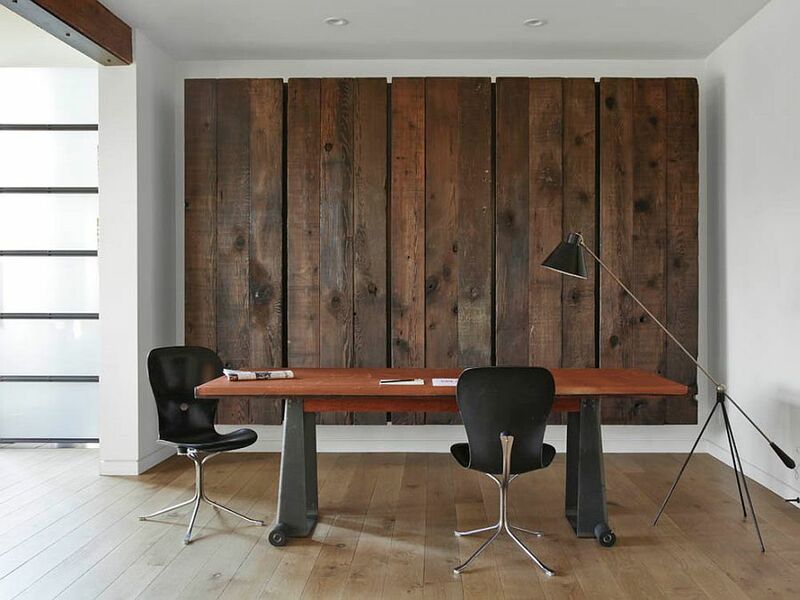 The home office might be a relatively new home design concept when compared with other spaces of the house, but thanks to both innovative designers and homeowners, there is no lack of inspiration in this regard. While some prefer a small and smart workspace that is neatly tucked into the corner of the bedroom or the living space, others prefer dedicated home offices that allow them to work from home with ease. No matter what your requirement, every home office could do with a lovely accent wall that gives the room an instant focal point. And it is spirited and stylish stripes that take over today’s post! 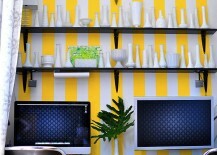 Striped accent walls need not always be one giant wall that is completely draped in monotonous stripes. 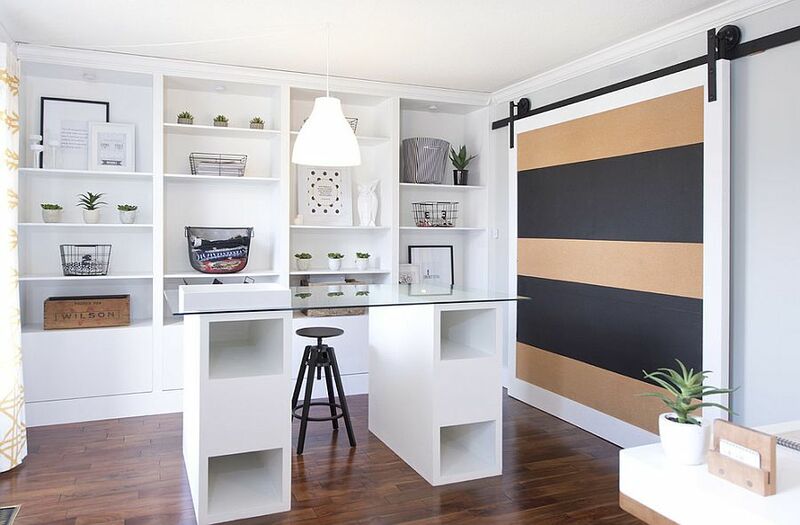 While paint is often the preferred choice, the 10 gorgeous home offices on display today add the striped feature wall in ways that go beyond the mundane. Enjoy! An accent wall with alternating stripes in bold and light hues brings the room alive while ensuring that the color scheme of the space is largely untouched. You can either introduce an entirely new color in a neutral setting or use one of the accent colors that is being already used in the home office for the stripes. 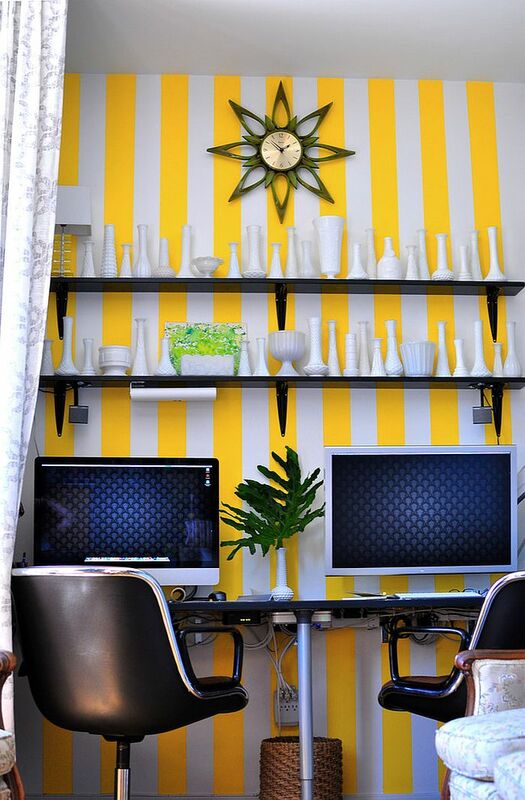 The small workspace here turns towards striped wallpaper with yellow goodness to get the job done with panache! We absolutely love this accent wall addition, as it does not really use the entire canvas of the wall and yet makes a dramatic impact visually. 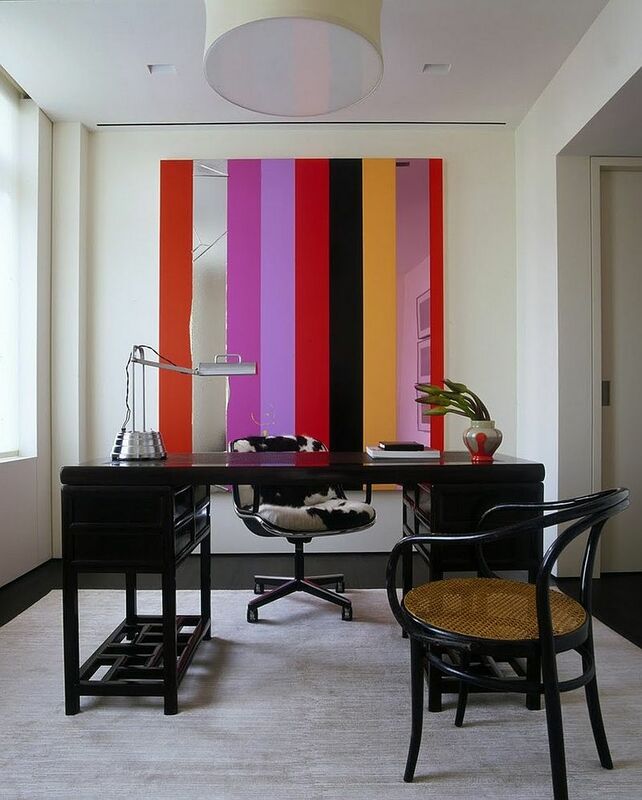 The wall art installation here brings the stripes to the home office and does so in a playful and colorful fashion! Crafted using canvas, mirror surface and of course brilliant hues, it is bound to steal the show in any modern room it adorns. 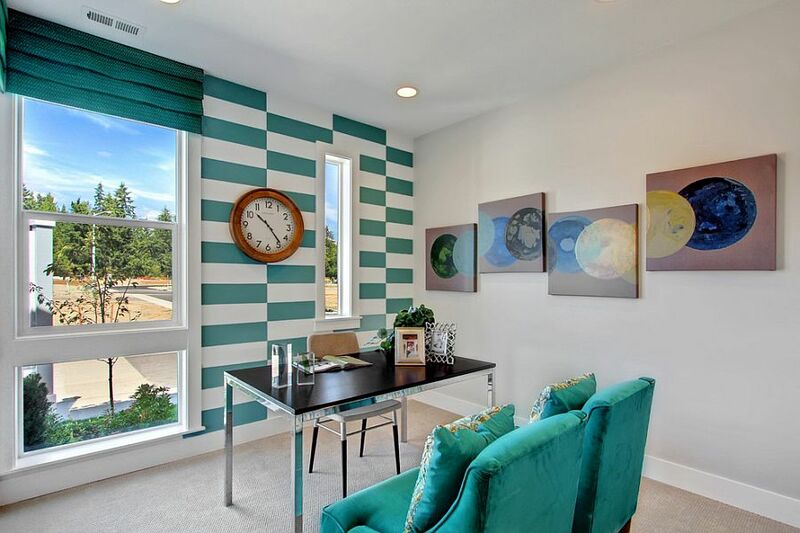 Once you take a look at the accent wall design below, you will realize that simple painted stripes are a thing of the past. A sliding barn-style door painted with gorgeous colors helps shape the feature wall here, and while it does not sport overtly bright colors, the extensive use of white in the rest of the room highlights it perfectly. And for all you know, there might be a passageway or even a closet hidden behind that sliding door! 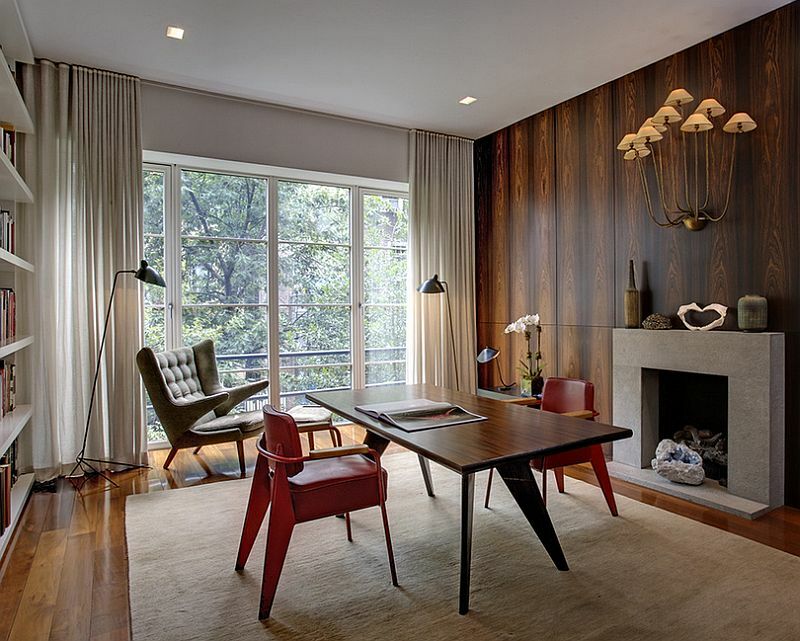 If paint and wallpaper are not what your home office needs, try to usher in some textural contrast with wooden wall paneling. 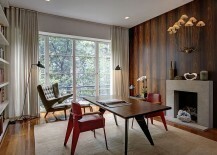 Wooden panels also can add stripes to the room without it seeming too obvious. This approach works even more beautifully in contemporary spaces that are filled with stone, glass and concrete. The home office below is perfect for those who work from home all year long, and it offers a variety of storage and display solutions along with a spacious workstation. Yet it is the unique wall with wooden slats that steals the show and gives the room an inimitable visual appeal. Ample natural light and a relaxed color scheme complete the lovely setting. This is another accent wall where stripes are not the obvious feature, but they still make their presence felt. Embracing a serene, midcentury modern vibe, this home office brings together iconic decor, a touch of gray and the warmth of wood. Adding a fireplace to the space and an extensive bookshelf allows the room to also function as a cozy home library and smart reading nook. For those looking for less extravagant and easier-to-create striped accent wall ideas, there is the classic approach of using simple painted patterns. As a rule here, one of the colors used for stripes is also the dominant hue in the room, while the alternate color can be an entirely different hue. 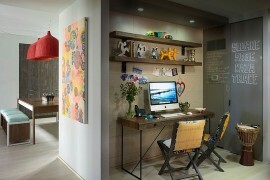 In contemporary home offices, it is the tone-on-tone approach that is most popular and seems to never fail. While horizontal patterns are more popular as a rule, use vertical stripes if you want to give the room a more spacious and airy vibe. 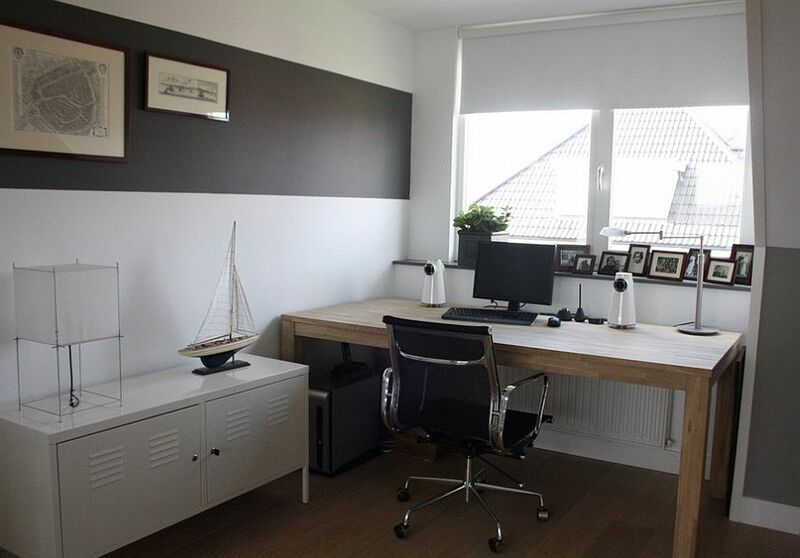 In really compact home offices, broader stripes are a wiser choice, as they create a less cluttered look.